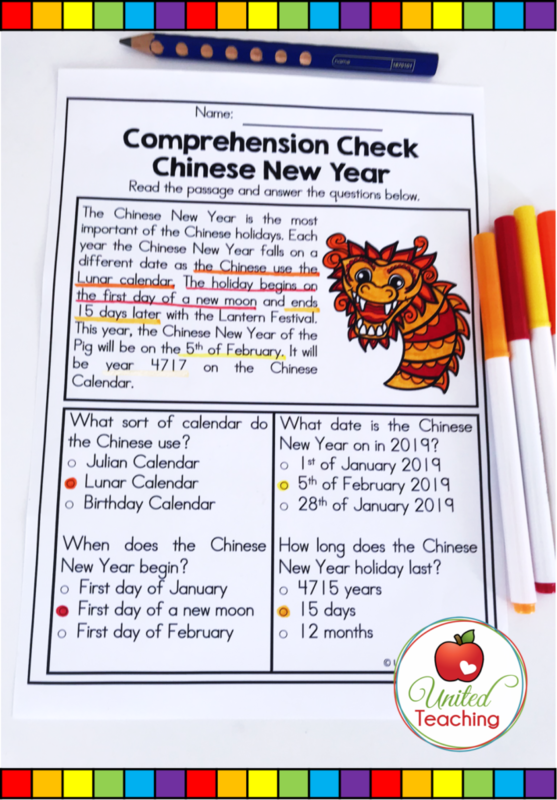 The Chinese New Year falls on the 5th of February in 2019. 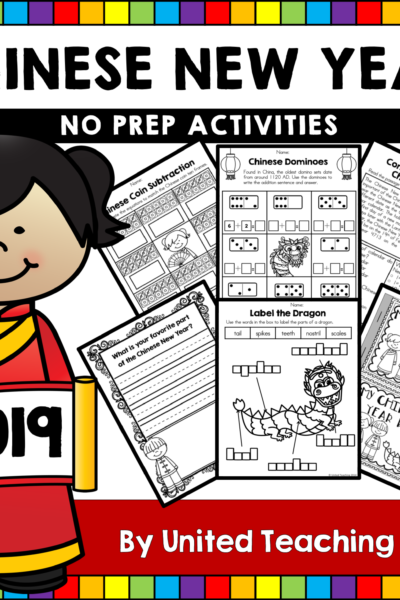 Be ready to teach with the Chinese New Year No Prep Activities packet. 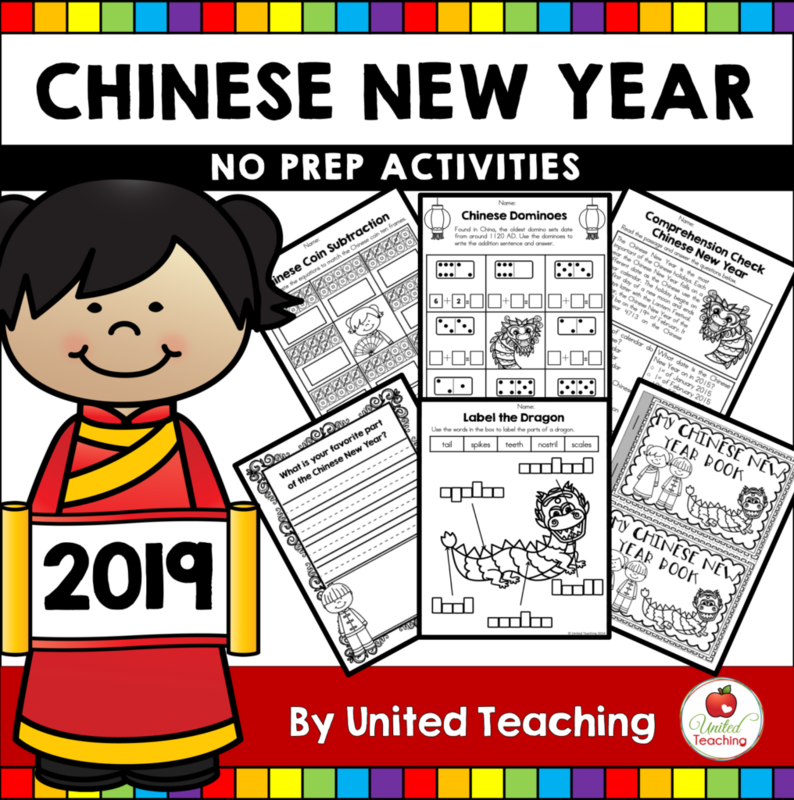 It contains printables that cover all areas of learning such as reading, writing, and maths while teaching students about the Chinese New Year. 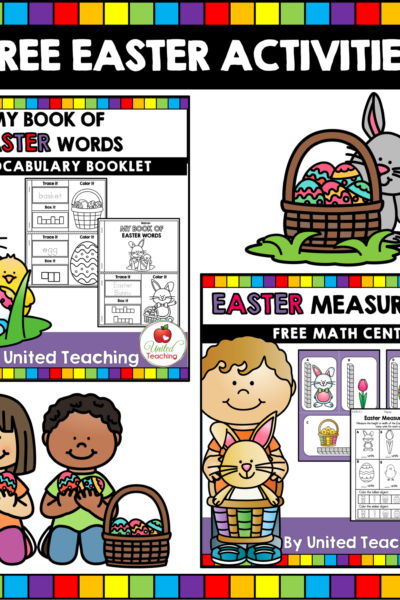 There is a classroom survey, games, comprehension activities, writing prompts, maths activities, booklets to make, and more. See the full list of activities below. 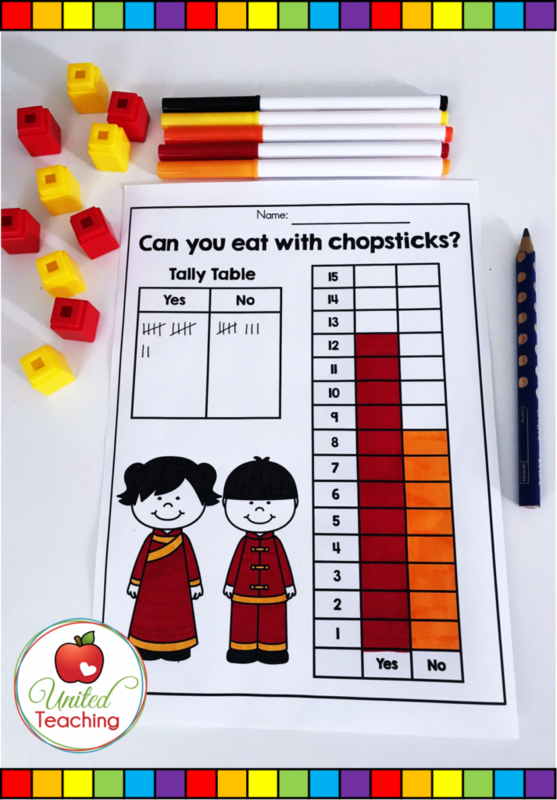 • Can You Eat with Chopsticks Survey? Students construct simple sentences to match the picture. Then they write the complete sentence below. 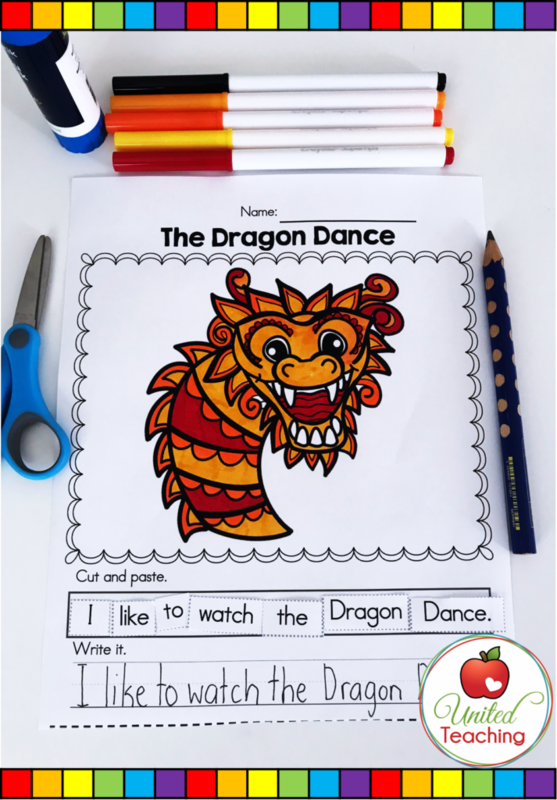 This is another scrambled sentence activity which is suitable for Kindergarten and 1st grade students. 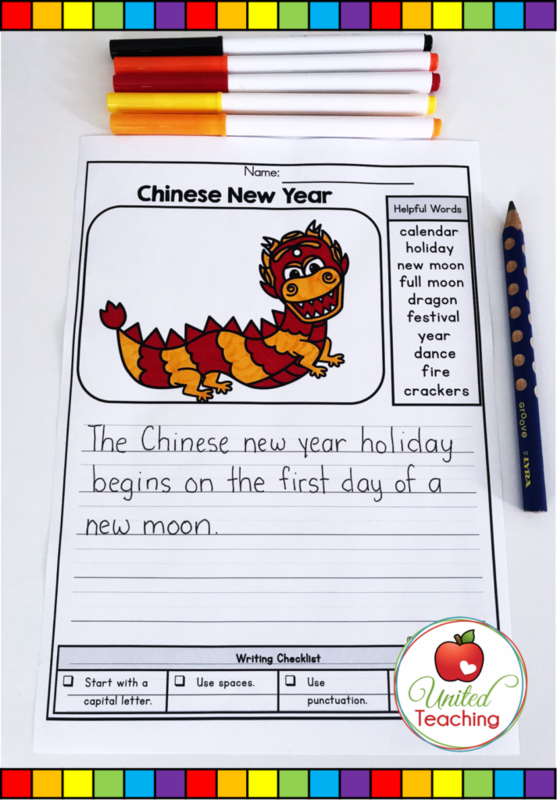 Students read and learn about the Chinese New Year in this comprehension check. This is an ideal activity for small reading groups. 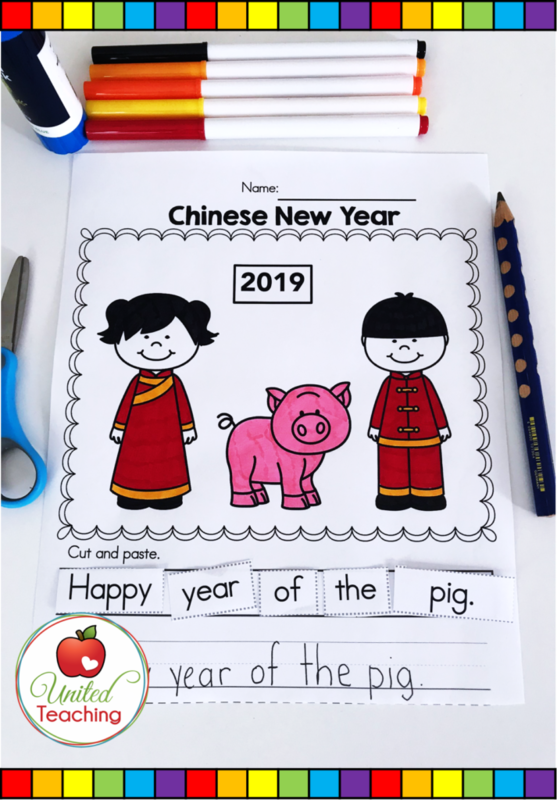 This Chinese New Year picture writing prompt contains a helpful word list to support writers with their spelling, a writing checklist and a cute coloring picture. Labeling is an emergent writing skill and an ideal activity for Kindergarten and 1st grade students. 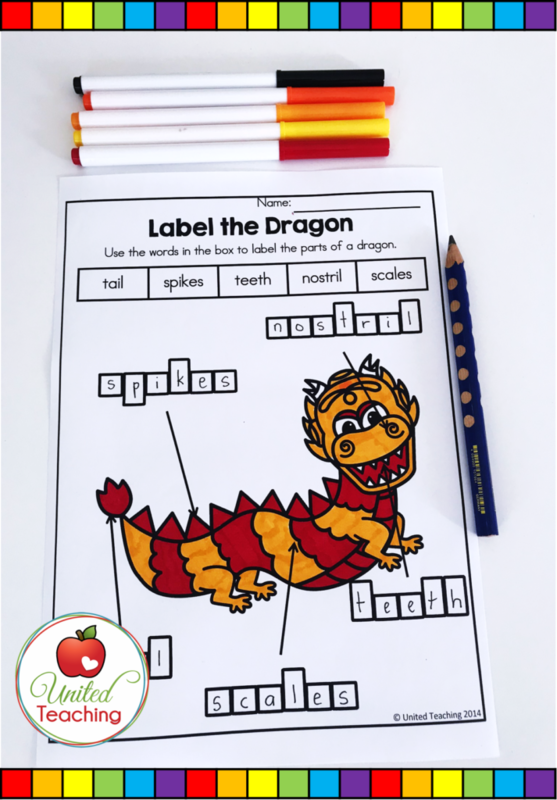 A word list and letter boxes are provided to assist students in labeling the dragon correctly. Can you eat with chopsticks? Students will be engaged and have so much fun doing this survey activity which covers math skills and cultural study outcomes at the same time. 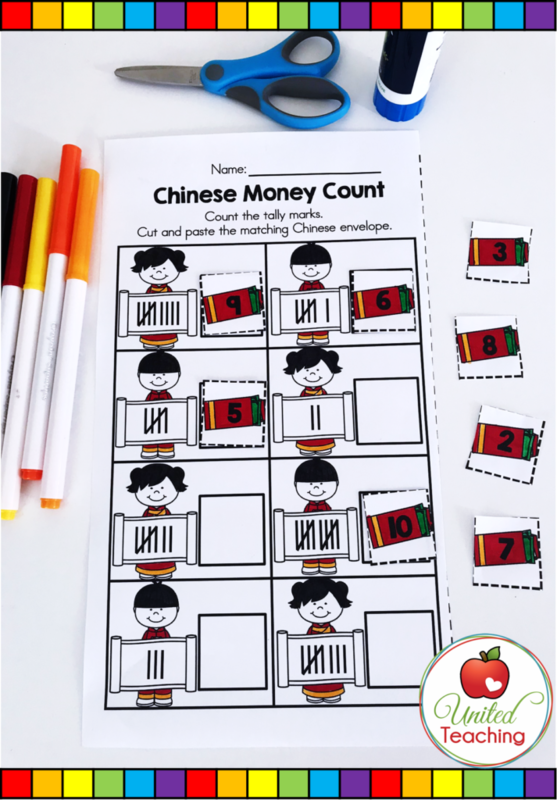 This quick counting activity is ideal for morning work, math centers, substitutes or for homework. Students count the Chinese objects and color the matching number. 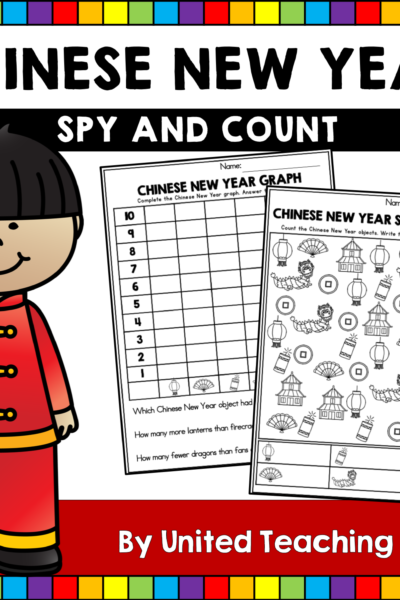 The cute pictures are perfect for the Chinese New Year. 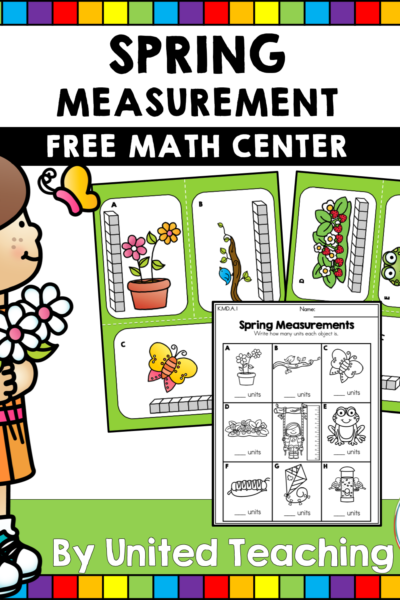 This no prep activity is ideal for math centers. 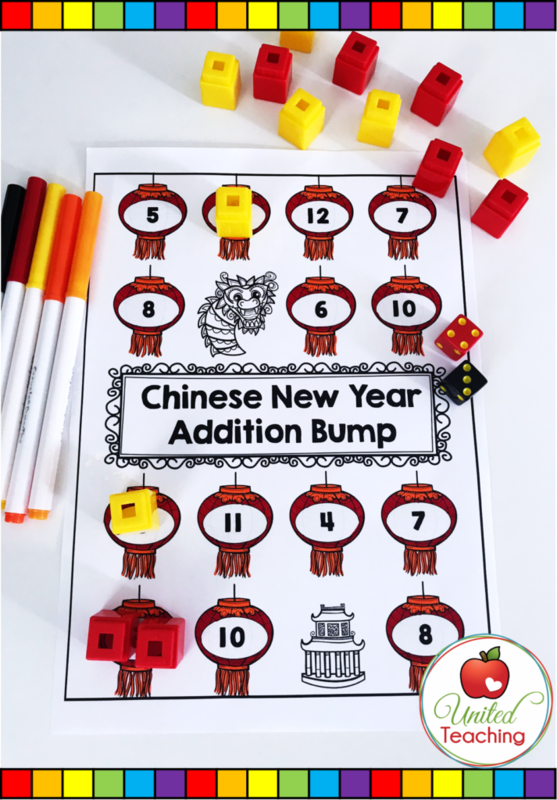 Children roll two die, add the numbers and place a counter on the result. But be careful! If another player rolls the same result they can bump you off. The oldest domino set was found in China and dates back to 1120 AD! 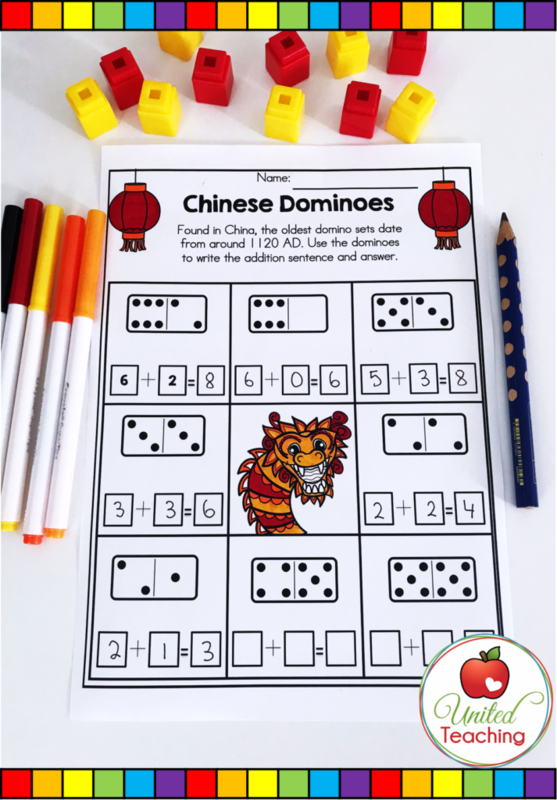 Reinforce basic addition skills with this worksheet in which students add the dots on each domino. 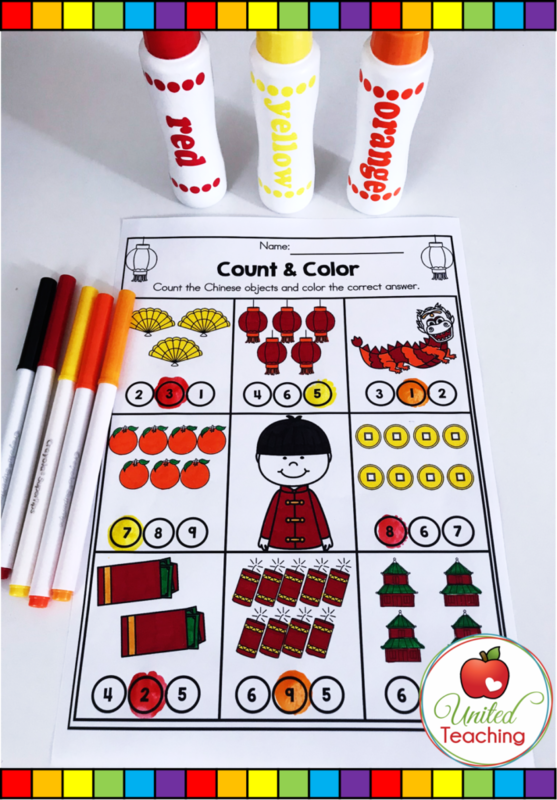 Teach and reinforce tally marks with this fun cut and paste activity. 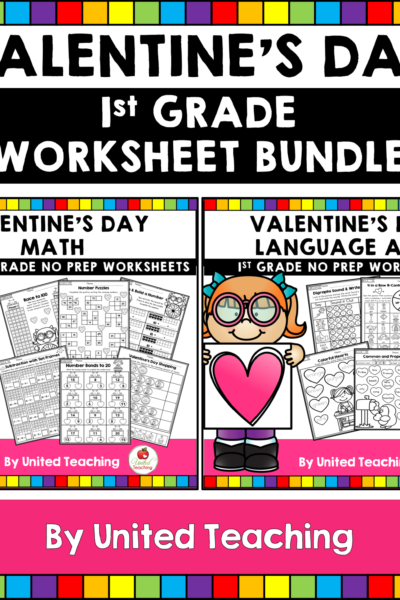 Great for math centers or for homework.